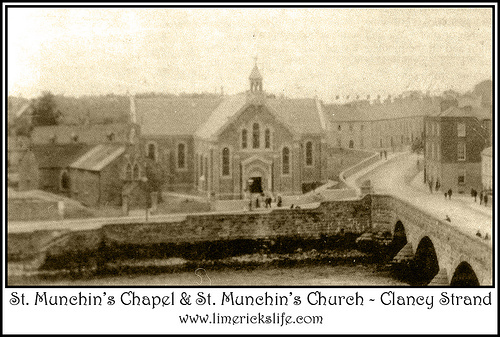 Situated on Clancy’s Strand St. Munchin’s Church was built in 1922 to replace older church of the same name which had been on the site since the easing of the Penal Laws in the mid 1th century. 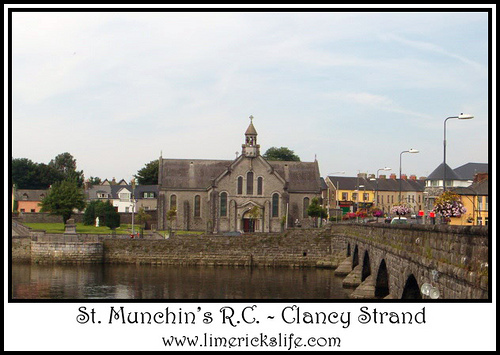 St. Munchin is the patron saint of Limerick. The name comes from “little monk” as the Saint’s original name has been lost with time. The picture below shows both St. Munchin’s, the earlier chapel was built in 1799, this was built on a yet earlier chapel which was erected in 1744, this was the first Catholic Chapel built in Limerick City after the Reformation. It is interesting that Limerick have St Munchin as the patron saint of the city as folklore tells us that while Munchin was building his church he asked some locals to help. They laughed at him and walked on, then some visitors to the city passed and he asked for their help. As these strangers to the city assisted the saint he put a curse on the city that the “Stranger shall flourish while the native shall perish”. Even so, there are now two churches, a parish, and a number of schools dotted around the city to a man who supposedly cursed the people who chose him as their patron.